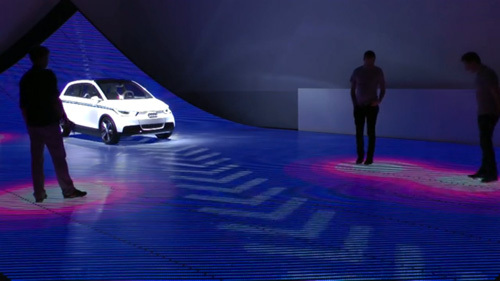 Audi to showcase its A2 concept at the Design Miami 2011, created a 190 m2 three-dimensional LED surface that provided a glimpse of the future of our cities where infrastructure and public space is shared between pedestrians and driverless cars. The installation demonstrated how the city surface would continuously gather information about people’s movements and allow vehicles to interact with the environment. The installation used a real-time graphics engine and the tracking software, that received live inputs from 11 Xbox Kinect cameras mounted above the visitors heads. Through the cameras the movement of the visitors were processed into patterns of movement displayed on the LED surface. 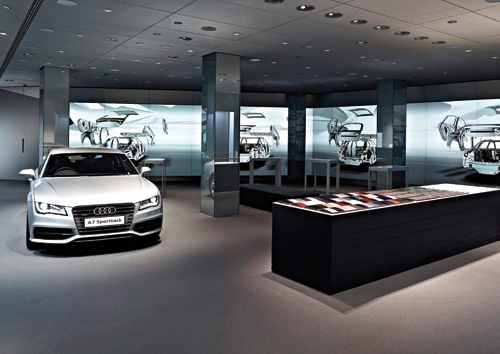 To solve space challenges at its retail outlet in Piccadilly Circus, Audi has used groundbreaking technology to present its growing model line-up. Visitors can now digitally select their vehicle from several hundred million possible configurations and experience it in realistic 1:1 scale on special powerwalls. Various details such as drivetrain, bodyshell, LED light technology etc are presented with interactive gestures, touch and physical sample recognition methods. 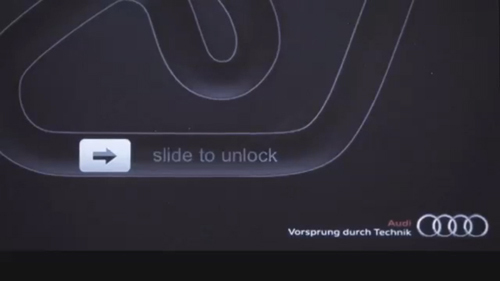 The whole immersive experience helps make the innovations understandable on an intuitive level. 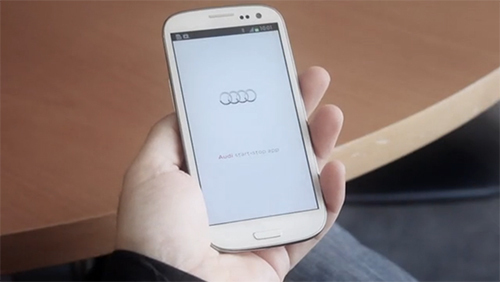 The future of automotive retail is here and Audi is leading the way, with plans to roll out the experience at 20 locations in major international cities by 2015.